Canadian Tire Bank is offering a 1% bonus on the interest rates they pay on high-interest savings accounts (HISAs). For the first 90 days for new customers, the regular HISA currently pays 2.5% and the TFSA HISA pays 3.5%. But, how much is this bonus interest really worth? If you put $5000 into one of these accounts, the extra 1% interest over 90 days will earn you a bonus of a little over $12. After the 90 days are up, the interest rate will return to normal, which is currently 1.5% for HISAs and 2.5% for TFSA HISAs. Getting an extra $12 is better than a kick in the head, but the important thing is to compare the regular interest rates offered on savings accounts by different banks. Unfortunately, the banks tend to trumpet introductory rates and downplay regular rates. If you're thinking about taking Canadian Tire Bank up on their offer, a couple of points in the fine print to consider are that the bonus 1% has a balance cap of $100,000 and that interest rates are subject to change without notice. The Ontario Lottery and Gaming Corporation has more marketing trouble as two Toronto convenience store owners are accused of orchestrating a multi-million dollar insider lottery win. The OPP are holding back details until they give a press conference later today. It’s not clear at this point whether this is simply a case of a store owner telling a winning customer that the ticket wasn’t a winner as in previous cases or whether the scheme is more elaborate. Either way, this is further embarrassment for OLG. I’d like to think that this means that OLG executives won’t be getting bonuses this year, but I’m not holding my breath. If you needed another reason to avoid lottery tickets, you’ve got it. Update: Further information indicates that this is just a case of a convenience store owner telling a customer who won that the customer didn’t win. Warren Buffett says that the U.S. is still in a recession despite the fact that by the usual standard, the recession is over. He claims that his definition better reflects the economic realities of average people. 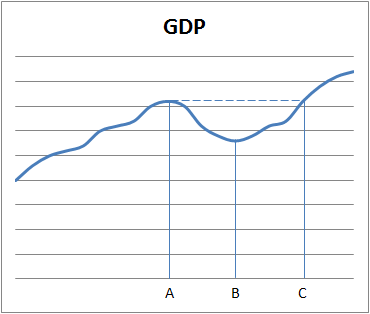 To understand what Buffett is saying, consider the following chart of a hypothetical history of Gross Domestic Product (GDP), a measure of the output of an economy. 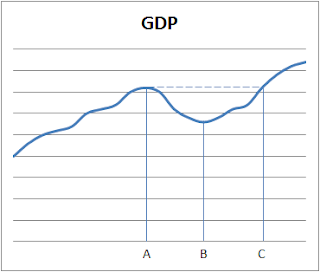 GDP starts to drop at time A, begins to increase again at time B, and recovers to its previous high at time C. By the usual definition, the recession lasted from A to B, and the recovery started after B. But Buffett says that people are still suffering while GDP levels are depressed. He says that the recession is from A to C and that the period from B to C is just a “technical recovery”. Just because things are improving, we can’t conclude that things are great. At some point in the winter it starts to get warmer, but it is still cold. Winter is over when it warms up, not when it stops getting colder. As is usually the case, Buffett makes a lot of sense. Want to read about an accounting trick that will make you shake your head? Some U.S. states are booking savings now for cuts to the pensions of workers who haven’t been hired yet. In a similar vein, I just saved thousands of dollars by deciding not to buy clothes in the decade after I die. Larry Swedroe explains five reasons why an aging society doesn’t mean stock market doom. Canadian Couch Potato brings us the story of a woman who tried to set up an investing account at a TD branch. The catch is that she wanted to buy TD e-Series funds and not the usual high-cost funds that get sold to unsuspecting customers. This one is quite funny. Canadian Capitalist compiles his list of ETFs he wishes existed. Preet Banerjee thinks that HXT, the new Canadian ETF covering the S&P/TSX 60, isn’t all that risky and prefers it to XIU. Big Cajun Man is shocked by the prices of recreational vehicles. Million Dollar Journey conducted a poll to find out how much of their income people save. Tom Bradley thinks that even with the higher capital requirements for the world’s banks, they’re still not high enough. Money Smarts makes the case for not automatically reinvesting dividends. I tend to avoid talking about politics because I tend to dislike all of the political parties for one reason or another, but I was struck by one of Jack Layton's remarks in an interview on CBC radio. He said that he wants to limit credit-card interest rates to 5% over prime. This sounds good, but he doesn’t mention the likely consequences. Whether we like it or not, banks are in the business of making money. They offer credit cards because they make money from them. The high interest rates offset the losses from a fraction of credit-card holders who default. If interest rates are capped, banks will only offer credit cards to more credit-worthy people. If this 5% over prime cap came into effect and the banks could find no loopholes for replacing the lost interest charges, they would cancel hundreds of thousands or possibly millions of credit cards in Canada. Even people with steady jobs would have difficulty getting a credit card if their pay level is too low. In principle I’m not against cutting off the supply of high-interest credit. Of course, credit cards aren’t the only form of credit that charges high interest. Layton would have to limit the interest rate charged everywhere else as well. The only remaining problem would be loan sharks – a problem severe enough to make it a bad idea to just cut off the supply of legal credit. Canadians would likely be better off if they could only borrow as much as banks are willing to give them at prime plus 5%. I don't know how to regulate lending to reduce interest rates without nasty consequences such as cutting off credit for millions of Canadians and a booming illegal loan-shark industry. Most of us have a strong desire to have more money, but our reasons vary. I’ve struggled to express my thinking on this subject clearly and concisely, but Jonathan Chevreau managed to say it in three words: “freedom, not stuff”. I don’t have much to add to Chevreau’s remarks – I encourage my readers to see what he had to say. Stuff always seems great when you’re buying it, but it loses its appeal quickly. It makes no sense to go to work and trade your time in return for more stuff. It's not hard to find people who criticize the idea of investing a portfolio entirely in stocks. They often make some very strong points in favour of including some fixed-income investments in a portfolio. My purpose here is to defend the all-stock portfolio for the right investors. Let me start by saying that an all-stock portfolio is not for everyone. In fact, it probably only makes sense for a small minority of investors. The arguments commentators make against an all-stock portfolio effectively identify people who shouldn't own 100% stocks. Let’s look at some of the pros and cons of an unleveraged diversified portfolio of all stocks. Pro: Over the long run, stocks have outperformed bonds. This is the only important advantage of stocks over bonds. 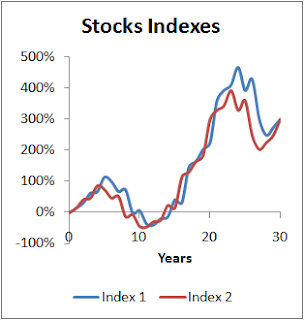 Over long periods of time, stocks have consistently outperformed bonds. The hope is that this will continue. There are good reasons to believe that it will continue. People tend to be risk-averse and will demand a higher return for accepting risk. Con: Stocks can crash and takes years to recover. This is true. However, for stocks to continue to outperform bonds over the long term, the period after a stock market crash must have large enough stock returns to offset the crash and overcome the steadier bond returns. But this only helps the investors who stay the course. If an investor panics and sells, he or she will miss out on the recovery. There is no guarantee that the recovery will come quickly, but recoveries have always come along eventually. The recent stock market crash in 2008 and 2009 was a good test of investors’ temperament. Author Derek Foster was well-known for advocating stock-based investment strategies, but lost his nerve and sold at a bad time. This shows that even apparently knowledgeable and experienced investors can find that they don't have the temperament for an all-stock portfolio. Foster would do well to balance his portfolio with some fixed income to avoid a repeat of his costly mistake. This period was a good test for me as well. I’ve lived through more minor stock market declines, but this was a big one for me. Fortunately, I passed. I spent the time I devoted to investing gathering my nickels to buy more stocks rather than biting my nails while wondering when I should sell out. Con: During market declines, withdrawals can decimate a stock portfolio. This is very true. It makes no sense for retirees or anyone else who needs to draw on their portfolios for income to be 100% invested in stocks. This can even apply to people who might need to make withdrawals. If losing your job during a market decline is a possibility that will lead to drawing on your long-term savings, you should consider allocating some of your money to something less volatile than stocks. As a rule of thumb, investors should consider safe investments for any money they might need in the next three years. More conservative investors may choose five years instead. Con: The high volatility of stocks keeps investors up at night. A decent night's sleep is important. It makes little sense to live in fear. Each investor has to choose a level of volatility he or she can live with. However, don't delude yourself. 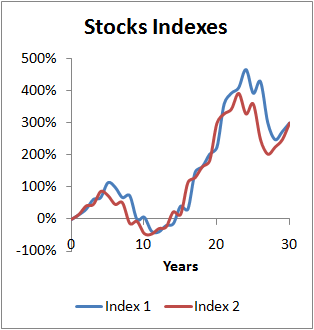 Over the long run, GICs have had significantly lower returns than stocks. If you make a choice for calm over the potential for higher returns, this might be the right choice for you, but it won't change the fact that you are very likely to underperform stock market indices over the long run. Most people are not good candidates for an all-stock portfolio. It may even be true that most people who think they are good candidates for an all-stock portfolio really aren’t. It’s hard to know how you’ll react to market declines until you live through them. The recent crash of 2008 and 2009 should have given you some clue about your investing personality. If you confidently ignored all the doomsday talk of the death of stock investing, you may be a good candidate for an all-stock portfolio. If you got caught up in all the negativism in even the slightest way, consider a less volatile portfolio make-up. Larry Swedroe exposes the misleading techniques used by FundQuest to make it seem that active mutual funds perform well. Larry gives a couple of simple examples that make it clear how biased the numbers become. Bloomberg reports that three-quarters of Americans think that financial advisors have a fiduciary duty. This means they think that financial advisors have to put their clients’ interests ahead of their own. Of course, this isn’t true and the industry would fight hard against any such requirement. Paul Waldie reports that 170,000 Canadians are targeted by CRA for bogus charitable donations. I find it amazing that people think that a scheme where you deduct more than you contribute could be legitimate. Canadian Capitalist reports that TD Waterhouse is now offering trading on global stock markets, for a price. John Heinzl makes a strong case for the need to educate yourself about investing and not trust an advisor too much. Rob Carrick has some excellent advice on keeping fees to a minimum with your online broker. Preet Banerjee says that training for financial advisors isn’t good enough. Perhaps the word “advisor” should be reserved for those who have more extensive training. Million Dollar Journey reviews a new Canadian low-cost brokerage, Virtual Brokers. Thicken My Wallet makes the sensible suggestion to let others try out new types of financial products before investing in them yourself. Money Smarts shows how to determine the value of a home renovation. Financial Highway discusses some of the pros and cons of online banks that might not have occurred to you. It’s fairly easy to figure out what a restaurant lunch and a fancy coffee a day are costing you, but other things are a little harder, such as the cost of bumping your house thermostat up a degree in winter. I have a hot tub attached to my pool that I use in late spring and early fall, but it isn’t obvious what it costs to use. Most of the time, water circulates through the hot tub and pool, so that both are at the same temperature. To use the hot tub, I have to divert all water flow to the hot tub and heat the water. I’ve always had the vague feeling that this may be more costly than it is worth, but hadn’t really worked it out. Since I use the hot tub during cooler weather when I’m no longer heating the rest of the pool, the amount of heating required varies with the pool’s temperature. The amount of heating required ranges from about 30 to 60 degrees Fahrenheit. So the question now is how much it costs to warm the hot tub by a degree Fahrenheit. After some experimentation, I’ve found that the hot tub heats up 20 degrees in 13 minutes and the heater takes 37 seconds to consume one-tenth of a cubic meter of natural gas (based on timing the spinning pointers on the gas meter). The last part of the equation is that natural gas costs me about 37 cents per cubic meter right now. This includes all extra taxes and charges that are proportional to my gas usage. So the marginal cost of heating up my hot tub is between $1.17 and $2.34. This is less than I feared, and I’ll probably worry less about using it. Of course, this is just the extra cost of actually using the hot tub. I pay other fixed costs that I haven’t figured out yet. According to a recent poll by the Canadian Payroll Association, 59% of 2766 people polled say they would be in financial trouble if their pay were delayed by just one week. It seems that most of us just aren't wired for saving. It's hard to interpret exactly what this poll reveals. It all comes down to what the respondents interpret “financial trouble” to mean. For some it may mean bankruptcy, but for others it may mean a relatively minor inconvenience. In my case I wouldn’t say that delaying my pay by a week would cause me real trouble, but if it happened at the right time, it might force me to write a cheque against a different account than I normally would. This is hardly trouble, but it could be a minor inconvenience. Setting aside the question of how many people really are living hand-to-mouth, I’m not too surprised that many Canadians’ finances are in poor shape. I don't think that our hunter-gatherer history did much to prepare us for dealing with more than a day’s worth of wealth. There was no point in hoarding meat or berries. It would rot or others would steal it. The idea of wealth that lasts for years is a modern phenomenon. It takes some rational thinking to make decisions about wealth; we're not wired to make these decisions well. Many people tend to focus on today's cash flow and let tomorrow take care of itself. Access to borrowed money can be a disaster for people like this. Larry MacDonald reported on interesting research into using “robot traders” to prevent market bubbles. Unfortunately, this research (paper available here) by Suhadolnik, Galimberti, and Da Silva fails to address some serious real-world constraints. The idea is that based on the researchers’ model of trading patterns, adding some contrarian robot traders that trade against the herd tends to stabilize stock markets and prevent bubbles. This sounds plausible, but it brings up serious questions about how this idea could be implemented. Where will the money for robot trading come from? “Financial resources involved in stabilizing the stock market is not addressed.” I don’t know if contrarian robots would make or lose money over the long run, but contrarian strategies can definitely lose money for very long periods of time. I definitely don’t trust the government to use tax money to trade stocks with robots. The researchers did their analysis assuming that the robots would represent “20 percent of the total market turnover”. This would require a massive amount of money. The researchers describe this as a “limitation” and go on to say the following. If government-controlled robot traders ever become a reality, the stock-trading game would change completely. Traders would no longer concern themselves with taking money from each other; they would focus on taking money from the government robots. How comfortable would you feel with the government robots playing the stock market with billions in tax dollars with traders all over the world trying to beat the robots? This is an interesting line of research, but I have little hope that it will ever become practice. It can be frustrating to buy something and see it on sale for a lower price a few days later. Some businesses will rebate the difference to you if you complain. This was our experience with Dell. I bought a computer for my son before he headed off to university. We were running out of time, and even though he wanted to buy his own components and put it together himself, we opted for convenience and bought from Dell. We also bought a printer/scanner at the same time. My wife happened to take a look at the Dell web site the day after placing the order, and the printer's price was $40 lower. Even though we waited for a couple of weeks after the computer and printer arrived to complain, Dell cheerfully agreed to give us the $40. On the down side, the printer didn't come with a USB cable needed to connect it to the computer. Given that people buy from Dell for convenience, it's hard to understand why the Dell web site didn't at least warn us that we'd need a USB cable and give us the option to buy one with our order. Expert computer users wouldn't be put off by a missing cable, but imagine some grandparents showing up with a shiny new computer for their granddaughter. It matters a great deal to the grandparents that the computer be put in working order quickly instead of seeing all excitement deflate as the child has to wait for a few days for the computer to be put in working order. The missing cable wouldn't have been a problem if we had opened the printer box at home. I have several old USB cables lying around. But, we didn't open the printer and install it until we were in my son's dorm room. This may have been poor planning on our part, but Dell played their part in causing this problem, too. So, we've mailed a USB cable to my son along with a few other forgotten treasures. I give Dell full marks for how they handled the rebate, but their web site could do a better job of protecting the unwary from forgetting necessary components. Canadian Capitalist reports that we’re in for more hikes in hydro rates. Preet Banerjee thinks that stock-picking contests teach the wrong lessons. I agree that the short-term focus teaches gambling more than it teaches investing. Ellen Roseman takes Equifax and TransUnion to task for charging for credit reports when they are supposed to provide them for free. Larry MacDonald explains that you need to be careful how you designate a beneficiary for your TFSA in the event of your death. Million Dollar Journey explains that some life insurance policies are set to implode due to poor returns on the investment portion. Big Cajun Man has some fun observing that interest rates have risen 300%! Money Smarts has learnt his lesson on buying labour-sponsored funds for the extra tax breaks. Freakonomics brings us John Green’s excellent anti-penny rant. Tom Bradley at Steadyhand reports that the Alpha Group (owned largely by Canada's big banks) is being investigated for conflicts of interest by the Investment Industry Regulatory Organization of Canada (IIROC). The concern is that your trades may not be executed at the best possible price. The Alpha Group seek to divert trades from the TMX to the Alpha exchange. Their initiative aims at "establishing a market place driven by profit and the best interest of the industry." Of course, profits come out of traders' pockets. I try to be wary any time I make trades, which isn’t very often. I check the bid-ask spread to make sure it isn't too wide, and I check that my trade is executed close to the appropriate price. Most of the time I get the advertised bid or ask price, but occasionally I get a slightly better or worse price. However, I don't trade often enough to judge whether anything unusual is going on. I would think that any extra profit by an exchange would come from either wider spreads or failure to execute trades at the advertised bid and ask prices. But who knows – businesses seeking higher profits can be very clever. The incentive to try to extract a few extra cents from each share traded is powerful. We need a strong IIROC to prevent systemic abuses. As an individual, one of the best forms of protection is to trade less often. The basis of many businesses is exploiting people’s weaknesses: think of cigarettes or donuts. Stingy Investor drew attention to an article about the successful industry of self-storage. This is yet another business that owes its success to our weaknesses. Many of us are pack-rats by nature. We save things that make no sense to save. I’m sure that there are those who use self-storage for reasons that make sense, but there are a great many who waste time and money storing useless junk they can’t bring themselves to throw away. I frequently re-examine the contents of my home to decide whether I’m storing things pointlessly. If I didn’t do this I probably would already have joined the ranks of people who have overflowing homes and a self-storage unit or two. Let me try to anticipate some objections. No, I don’t think that self-storage businesses should be prevented from operating. Yes, on some level, every business exploits our weaknesses – like the need for food and shelter. It’s just that some products and services have less redeeming value than others. How bad a particular industry is on this scale can be subjective. If you have a strong emotional reaction to the thought of having to get rid of say 10% of your stuff, you may have a problem. If you are thinking you need a self-storage unit, try examining whether you have an emotional need to keep a pile of useless stuff before spending your hard-earned money. With the change to the CPP penalty for taking your pension early, the calculation of what age is best to start collecting CPP changes as well. Most of these analyses to figure out the best age to start collecting CPP do not take into account possible investment returns. The old rules used to penalize you 0.5% per month for each month before age 65 you start taking CPP. Now it is 0.6%. In addition, you can grow your CPP payments by 0.7% per month for each month you delay the start of payments past age 65. So, if we call the CPP payments at age 65 a 100% pension, then if you start at age 60, your pension will be 64%, and if you start at age 70, your pension will be 142%. Note that these percentages stay fixed for the rest of your life. You'll get cost of living increases, but that's it. For most people, the most logical method of determining when to start taking CPP is by the sophisticated when-you-need-the-money method. If you can't stand the thought of working past age 60 and you think you can get by with a reduced pension, then age 60 it is. Otherwise some other age between 60 and 70 will likely be dictated by when you need the money. For a lucky few of us who have (or will have) enough money to optimize a little, the choice is more complicated. The usual analysis involves just adding the CPP amounts to figure out what starting age makes you the most money. With this simple method, if you won't make it to age 74, start taking your pension at age 60. If you will make it to some age between 74 and 82, take your pension at age 65. If you will live longer than age 82, start taking your pension at age 70. You need a crystal ball to follow this advice, but at least it gives some useful idea. This analysis took into account inflation because CPP payments rise with inflation, but it didn't take into account investment returns. Suppose that a retiree can afford to wait until age 70, but wants to know whether it makes sense to take CPP early and save the money. In this case, investment returns affect the decision. The following chart shows how the age break points vary with investment returns (after tax and above inflation). If our retiree expects to make no excess return above inflation, then we get the break points at ages 74 and 82 as in the earlier analysis. However, at 5% real return, the break points jump up to ages 79 and 92. 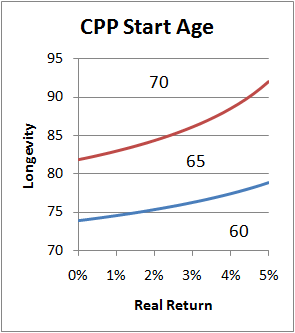 All this means that positive investment returns make taking CPP early even more attractive than in the simpler analysis.